Here's what we know so far about the suspect in the Florida school shooting. The man charged with opening fire on students at a South Florida high school has confessed to the shooting, according to a police report released Thursday. According to the report, Nikolas Cruz told interrogating officers that he "began shooting students that he saw in the hallways and on school grounds" on Wednesday afternoon. 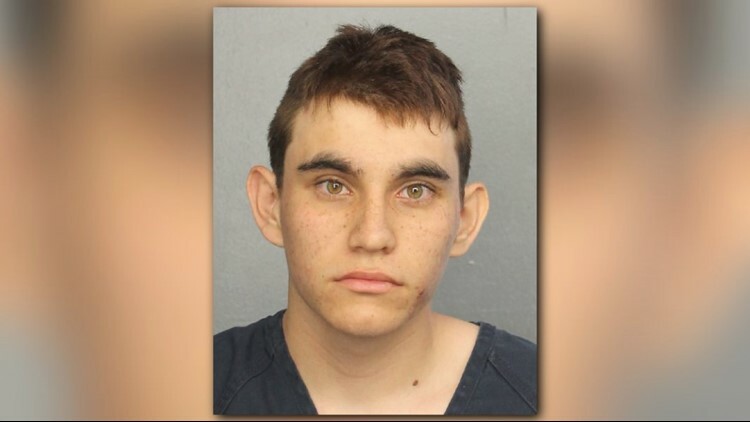 The report adds that Cruz told officers he "brought additional loaded magazines to the school campus and kept them hidden in a backpack until he got on campus to begin his assault." Cruz told investigators that as students began to flee, he decided to discard his AR-15 rifle and a vest he was wearing so he could blend in with the crowd. Police recovered the rifle and the vest. The police report adds that Cruz purchased the rifle in February 2017, but does not say where it was purchased. His attorney said her client is sad and remorseful. Students and neighbors describe the suspect in the deadly rampage at a Florida high school as a troubled teenager who threatened and harassed peers, talked about killing animals, posed with guns in disturbing photos on social media, and bragged about target practice in his backyard with a pellet gun. Cruz, 19, had his first court appearance Thursday afternoon and appeared in shackles and an orange jumpsuit. He is being held without bond. Cruz had been expelled from Marjory Stoneman Douglas High School for "disciplinary reasons," Broward County Sheriff Scott Israel said, but he insisted he didn't know the specifics. Math teacher Jim Gard told the Miami Herald that before Wednesday's fatal shooting of 17 people, Cruz may have been identified as a potential threat - Gard believes the school had sent out an email warning teachers that Cruz shouldn't be allowed on campus with a backpack. This photo provided by the Broward County (Fla.) Jail shows Nikolas Cruz. "There were problems with him last year threatening students, and I guess he was asked to leave campus," Gard told the paper. Student Victoria Olvera, 17, said Cruz had been abusive to his ex-girlfriend and that his expulsion was over a fight with her new boyfriend. He'd been attending another school in Broward County since the expulsion, school officials said. Cruz was an orphan — his mother, Lynda Cruz died of pneumonia Nov. 1 neighbors, friends and family members said, according to the Sun Sentinel. Cruz and her husband, who died of a heart attack years ago, adopted Nikolas and his biological brother, Zachary, after the couple moved from Long Island in New York to Broward County. Unhappy there, Nikolas Cruz asked to move in with a friend's family in northwest Broward. The family agreed, and Cruz moved in around Thanksgiving. According to lawyer Jim Lewis, who represents but did not identify the family, they knew that Cruz owned the AR-15 but made him keep it locked up in a cabinet and never saw him go to a shooting range with it. He did have the key, however. The family is devastated and shocked, lawyer Lewis said. During the three months Cruz lived there, he was respectful and quiet but also sad over his mother's death, Lewis told The AP. "No indication that anything severe like this was wrong," Lewis said. "Just a mildly troubled kid who'd lost his mom. ... He totally kept this from everybody." The family's son was a junior at the school and was there when the shooting happened, Lewis said. The family is cooperating as their home is searched and no one there is suspected of wrongdoing, he added. Longtime Cruz family neighbors Malcolm and Christine Roxburgh told the Sun Sentinel that the police came to the boy's house many times, as he used to get in trouble and harass people. Malcolm Roxburgh said a neighbor across the street kept pigs, and Nicolas Cruz targeted the family. "He didn't like the pigs and didn't like the neighbors, so he sent over his dog over there to try to attack them," Roxburgh said. "I said, 'What are you doing here?' He said he was looking for golf balls. I said, 'This isn't the golf course,'" she said. And, the couple said, when the boy didn't want to go to school, he would bang his head against a cement wall. They were scared of him. "He could have killed any of us," Christine Roxburgh said. Cruz was getting treatment at a mental health clinic for a while, but hadn't been there for more than a year, Broward County Mayor Beam Furr said during an interview with CNN. "It wasn't like there wasn't concern for him," Furr said. "We try to keep our eyes out on those kids who aren't connected ... Most teachers try to steer them toward some kind of connections. ... In this case, we didn't find a way to connect with this kid." Officials said they're dissecting the suspect's disturbing social media posts, without elaboration. But peers said they recognized Cruz from an Instagram photo posing with a gun in front of his face. The students called Cruz "weird" and a "loner" - even those who'd been friendly with him said they hadn't seen him in more than a year since his expulsion. He said students weren't surprised officials had identified Cruz as the shooter: "I think everyone had in their minds if anybody was going to do it, it was going to be him." Mutchler said. But Broward County School District Superintendent Robert Runcie said he did not know of any threats posed by Cruz to the school. On Thursday morning, Cruz was charged with 17 counts of premeditated murder after being questioned for hours by state and federal authorities. Weighing in at 5-foot-7 and 131 pounds and wearing a hospital gown after being treated for labored breathing, he was ordered held without bond and booked into jail. A previous version of this story, using reporting by the Associated Press, stated that a leader of a white nationalist group said Cruz was a member. We have not been able to independently confirm that information, nor has law enforcement. Associated Press writers Sadie Gurman in Washington and Bernard McGhee in Atlanta contributed to this report. Contributing: TEGNA Staff. People react at Marjory Stoneman Douglas High School in Parkland, Florida, a city about 50 miles north of Miami on February 14, 2018 following a school shooting. Police and security vehicles are seen at Marjory Stoneman Douglas High School in Parkland, Florida, a city about 50 miles (80 kilometers) north of Miami on February 14, 2018 following a school shooting.